This week, I worked on a list of all the substances that can be identified in the medicine chests at the National Maritime Museum. I am hoping that the drugs found in the chests will tell something more about when, how and by whom they were used. All in all, there are approximately seventy different kinds of materia medica on the list now. Some are very familiar, like aspirin, olive oil, powdered ginger and magnesium. Others have been banned as medicines for some time, and for good reason: mercury pills, laudanum and opium tincture for example. And some are downright creepy at first sight, like ergot of rye. Ergot of rye is a disease in rye plats, caused by the fungus Claviceps pupurea. 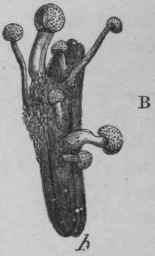 The fungi appear in the ear of the rye plant as dark brownish, oblong bodies. It used to be so common in rye, that until the 1850s it was believed to be a part of the rye plant. However, quite a while before that, people already knew that ergot was far from innocent. Already in the 1670s, Thuillier, a French physician discovered that ergot of rye was the most likely cause of a disease now known as ergotism. From the Middle Ages, there are sources describing a common but mysterious disease mostly referred to as ‘holy fire’ or ‘St. Anthony’s fire.’ Symptoms ranged from hallucinations to burning skin and the sensation that insects were wriggling under the skin. Sometimes gangrene of the extremities developed because of constricted blood vessels, and victims could lose hands and feet or their lives. Women with the disease frequently miscarried, and that was in fact the reason that ergot of rye ended up in nineteenth-century medicine chests. Thullier established the link between ergot of rye and holy fire from the fact that outbreaks mainly occurred in poor rural areas where rye bread was eaten with almost every meal; a food that was not on the tables of rich city dwellers, who ate white bread. When this became clear, midwives and physicians started to use extracts from ergot of rye in small amounts to induce childbirth in difficult labour, and most likely women tried it as an abortive in the case of an unwanted pregnancy. That explains why London chemist Richard Reece listed ‘The Ergot of Rye’ in his 1836 catalogue of drugs under the Selection of Medicines for Domestic Use, as a treatment for diseases of the womb and in difficult labour. However, I found the drug in a medicine chest supposedly used by Admiral John Lort Stokes (1812-1885) during his days in the Royal Navy. Now why would a Navy Admiral want bring a drug that seems to have been so particularly gendered? Was it just part of a ready-made medicine chest? Even if that was the case, it seems unlikely that he would not have taken it and replaced it with some other medicine more useful under the circumstances, as personal space on Navy ships was extremely limited. Another explanation may be that by the time Stokes brought the chest aboard with him, ergot of rye had become a cure for other affections as well – after all, it is still grown today in laboratories to distil particular toxins from it for medicinal purposes. Yet another small mystery to solve! On Monday I started work at the National Maritime Museum. So far it has been wonderful – everyone is very welcoming and interested in the project, and working in such a historically laden place is absolutely great. This Wednesday was the most exciting day of the week, as I was allowed to spend all day in a storage room with the medicine chests to study them. The first thing that struck me was their size or rather lack thereof. The measurements are in the catalogue, so I already knew the chests were not that big, yet seeing something with your own eyes is of course still an entirely different experience. These medicine chests upon closer inspection looked like very practical first-aid kits, each containing about twenty to forty different material medica. Then something struck me: before coming to London I had been reading up on eighteenth- and nineteenth century English Navy medicine, and the lists of prescribed contents of ship’s surgeons’ chests I had seen seemed far more extensive than the contents of these chests. So I checked again, and indeed, in 1806 the standard Navy medicine chest contained about 62 different substances. Does that mean the medicine chests at the NMM are not ship’s surgeons’ chests at all? It is possible, even if they were most likely used on ships. Most of them are simply too small to sustain a substantial ship’s crew with medical care for months or even years, and contain only drugs that can also be found in popular ‘companions to the medicine chest’ from the same period. Yet it is not so strange that someone boarding a ship, naval, merchant or exploratory, would invest in a personal medicine chest if he could afford it. Even if there was a surgeon aboard, there was a fair chance he would also fall ill and die at some point, and then it was most practical to have your own first-aid kit with you. Moreover, ship’s surgeons seem to have constantly complained about being underpaid, which may have led them to use the drug supplies otherwise, and some of them were very inexperienced. All the more reason to bring your own stash. Meanwhile, I have already found some exciting leads in the archives on where these chests might be from and how they were used… to be continued! PS: My initial plan this week was to write about the strange ceramics in huge Erlenmeyer flasks resembling wet anatomical preparations that I saw at the Naturmuseum Winterthur, but as I could not get into touch with the curator to ask who made them and how they were intended. I am still working on it, so maybe in a later blog! During the workshop, all kinds of objects starred in the papers: the white doctor’s coat, Indonesian keris daggars, seventeenth-century herbal guides, barometers, brain scans, models used in biology classes, even radiation, and of course the Leiden preparations. In the closing discussion, we saw that although we say that we write the history of things, what actually happens is that the materiality of objects is a way to access their meanings (which can change over time) and their reception history. This, to me, confirmed what I have thought for a while now, namely that although objects do have agency – they can influence what happens in a network of things and people – but that that agency is of a different nature than that of human actors. Another interesting issue we encountered was what happens with things that have lost their previous meanings, i.e. because they have been taken out of their original context and the new network they are part of does not remember and cannot (or will not) retrieve the original context. For example, the Indonesian keris one participant told us about had all kinds of magical, social and ritual meanings in certain parts of Indonesian society, but are now mere decorative exotic objects in some Western households. Of course, they may gain new meanings there; for the family who brought it with them from vacation it may be a beloved souvenir. But is that really a meaning? Kant would say that if you appreciate das Ding an sich, without caring where it comes from, who made it, or what purpose it might serve, that is the essential disinterested aesthetic experience. Fair enough, but in the case of objects we historians of science know or suspect to have had a meaning in the past, like instruments and preparations, this seems unsatisfactory: we want to know why the thing was made, how it functioned originally, influenced the people around it throughout time. We feel we have to in order to do these objects justice, and to answer questions regarding their preservation and display in a museum setting. Next week I’ll write about something more concrete: something peculiar that I saw at the workshop location, the Naturmuseum in Winterthur. *Here the annoying problem returns that in German and Dutch Wissenschaft/wetenschap can also include the humanities, whereas in English they are more or less excluded by the use of the word ‘science’.